Sen. Claire McCaskill (D., Mo.) says it was the "spectacle" created by Senate Democrats during their crusade to stop Brett Kavanaugh's appointment to the Supreme Court that hurt her reelection campaign. McCaskill's vote against Kavanaugh became a central theme of Republican Josh Hawley's successful campaign to unseat the two-term incumbent Democrat, but she says her vote wouldn't have been as disastrous if the effort wasn't mishandled by her party. "I don't think my vote [against Kavanaugh] hurt me as much as the spectacle that occurred," McCaskill told NPR on Friday morning, in her most extensive interview since her defeat. "There were mistakes made by my party in terms of how that was handled." McCaskill told NPR that she thinks Democrats made a mistake by keeping Dr. Ford's allegation secret until after Kavanaugh's initial hearing, saying it created the perception that it was an "11th hour attempt to gut a guy." "I don't think that communication [from Dr. Ford] to the judiciary committee should have been kept private as long as it was," she said. "The FBI deals with a lot of confidential information, and that would have absolved [judiciary committee ranking Democrat Dianne Feinstein] of the very real perception that this was an 11th-hour attempt to gut a guy." "People have black armbands on around the Democratic caucus, because it feels like we've lost Lindsey Graham," she said. "He is someone who was willing to step outside that bubble from time to time and really do the hard work on issues like immigration. We're mourning right now because we fear he's gone." "I like Claire, but I love the country more," he said after delivering remarks during a Hawley rally. He did not give her a pass for staying out of the spotlight during the Kavanaugh fight, characterizing her as "somebody that quietly sits on the sidelines while the mob gathers." 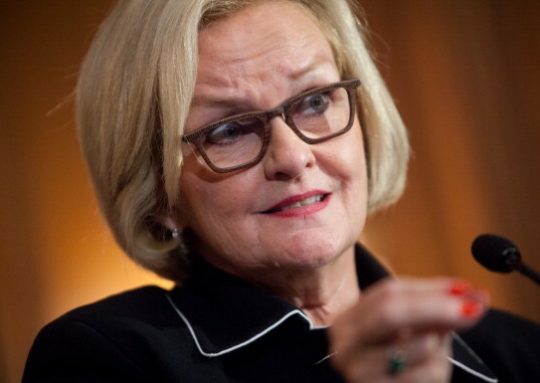 Representatives for senators Chuck Schumer (D., N.Y.) and Dianne Feinstein (D., Calif.) did not respond to requests for comment on McCaskill's comments. McCaskill told NPR she thinks Democrats will have trouble gaining back seats in the Senate if they continue to make it hard for self-proclaimed moderates like her to campaign in red states like Missouri. "This demand for purity, this looking down your nose at people who want to compromise, is a recipe for disaster for the Democrats," she said. "Will we ever get to a majority in the Senate again, much less to 60, if we do not have some moderates in our party?"